One of the biggest takeaways from Tuesday’s midterms is that voter suppression is a living, breathing machine that continues to make voting difficult for many. For much of this election cycle, the media has focused on the blatant practices of voter suppression in southern states like Georgia: this year, reportedly 53,000 Georgia voter registration applications were suspended because the information on their forms did not exactly match the information in government databases. Of those applications, 70 percent belonged to Black folks. But thanks to social media, where voters across the U.S. posted real-time photos and videos of long wait times, legal barriers, and other inconveniences at the polls, Election Day showed us that voter suppression exists outside of the South, and manifests in various forms. 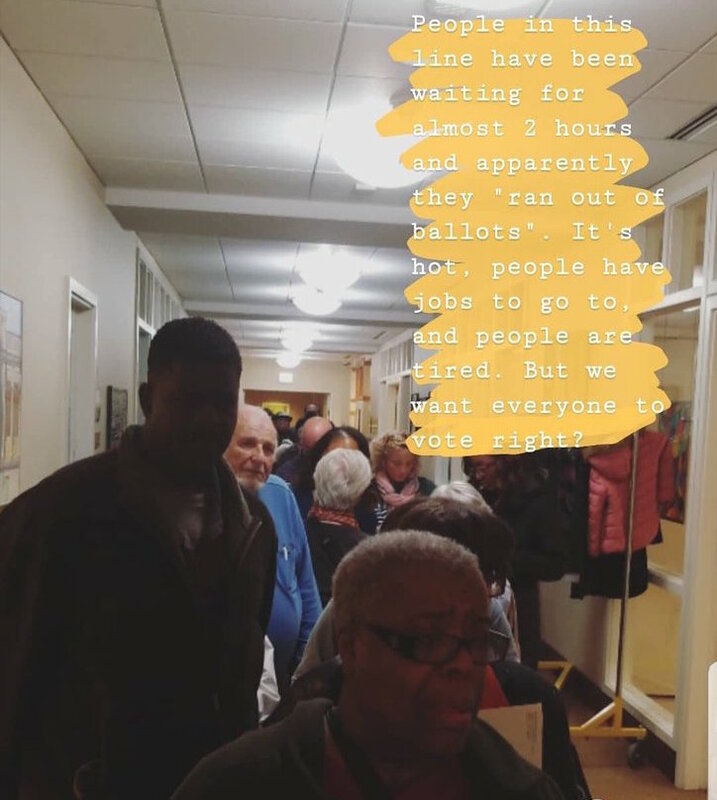 On Chicago’s South Side at Montgomery Place, a senior assisted-living place at 5550 S. South Shore Drive, dozens of voters stood in line for three to four hours after the polling station ran out of paper ballots. Sierra Council, a Hyde Park resident who moved to Chicago from Philadelphia about a year ago, took to social media to air out her grievances with the situation. 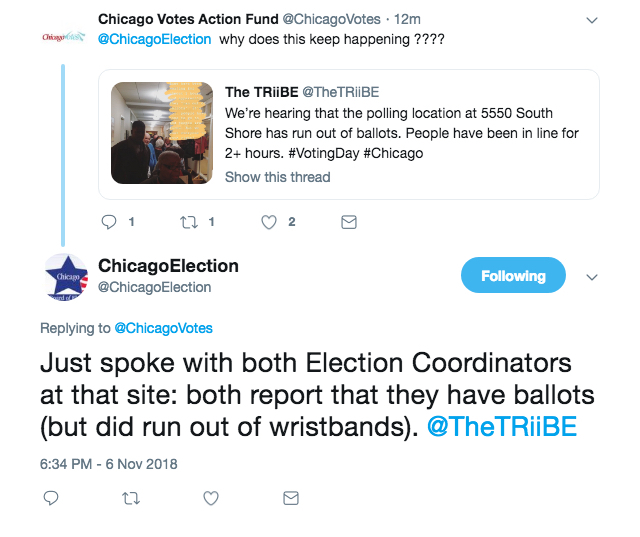 The TRiiBE posted Council’s image on Twitter around 5:50 PM, where it garnered the attention of voter advocacy groups such as the Chicago Lawyers’ Committee for Civil Rights and Chicago Votes. Though the polls were scheduled to close at 6PM, Council’s polling station didn’t receive more paper ballots until 7PM. According to the Chicago Board of Election, everyone in line by 7PM was guaranteed the ability to vote. But while people were still voting, Republican incumbent Bruce Rauner conceded the race, making Democratic opponent J.B. Pritzker the new governor-elect of Illinois. Across the country, races were being called while voters remained at the polls. “How y’all have a projected winner but all these people still need to vote?” Council tweeted at 8PM from her polling station, where folks were still lined up to vote. Council recounts her experience in our interview below. The TRiiBE: When you woke up Tuesday morning, were you excited to go out and vote? Sierra Council, 25: I wouldn’t say that I woke up excited to vote. I think there’s been a lot of pressure in the media, at work, and in other spaces that it is our civic duty to vote. As a person who is relatively new to Chicago, who plans to stay and invest in Chicago, I wanted to know more about what’s happening in Illinois. So I chose to vote. TT: What happened when you got to your polling location at 5550 S. South Shore Drive? SC: I wanted to take a break from work. I was working from home on Tuesday. I figured it would only take half an hour, or 45 minutes max to vote. When I arrived at my polling station around 3PM, there was already a line and it was moving incredibly slow. There was a significant number of seniors and people who were handicapped. There wasn’t more than 30 people in front of me in line, but even with those 30 people, it took about an hour to get from where I was in the back to the check-in table. Once I got there, one of the poll workers came out and said, “we’ve run out of ballots.” People started making calls, and organizations were saying more paper ballots were coming. That went on for another two or three hours. You had people talking about how they had to get to work for their shift. You had people calling organizations like Chicago Votes to make an official complaint. I started tweeting about it, and writing about it on Facebook, around 5:30PM. Around 6PM, there were organizations on social media saying that the ballots had arrived, but one of the election coordinators confirmed that there were no paper ballots. TT: The Chicago Board of Election replied to us on Twitter, saying that the ballots had arrived. TT: Were there any electronic machines there? SC: There were either eight or nine of the paper ballot booths, and there was one electronic station. However, the issue with the electronic station is, on average, it took about 30 or 40 minutes for a person to use it. I think that’s really in part to the fact that there was a large elderly population there that didn’t really know how to use the electronic station, and they needed help. TT: What time did the ballots arrive? SC: The ballots arrived at 7PM. Someone also sent pizzas, which arrived at 7:30PM. I can’t speak for everyone, but I was incredibly irritated by that time. I think all the vigor and excitement that I had to get invested in Illinois politics was completely gone by 7PM. I didn’t care who was on the ballot anymore. I just wanted to go home. I was hungry. I was tired. TT: Considering all the reports of voter suppression that occurred in states like Florida and Georgia, how did you feel coming out of this situation on Election night? SC: I am grateful for flexibility with my job. I am grateful for being young, able bodied, and healthy enough to stand in line in a hot space for a long time. But given all of those privileges, it still was an incredibly frustrating experience. It makes me really angry. Voting should be accessible. That’s what they tell you: “Oh, everybody should go out and vote. It only takes 20 minutes out of your day.” That’s what they preach. But is it accessible? For me, in this experience, it wasn’t. And it’s even more frustrating when I think about how difficult it must be for people who do not have the privileges that I have. If my job wasn’t flexible, if I wasn’t healthy enough to stand in line, if I had kids, I may not have been able to finish voting or it would have been an even worst experience.